Four years ago on this day I began blogging. I had previously contributed some photographs to my Facebook page but had not started serious blogging. Thanks to Debra Kolkka (see her blogs at https://bellabagnidilucca.com/ and https://bagnidilucca.wordpress.com/) I started this harmless hobby. Now 1502 posts later am I still enamoured of the activity? Today, 6th March, I went to Lucca where I read Oscar Wilde’s “The Canterville Ghost” to my second media class at the scuola Da Vinci (where I have been a “lettore di madrelingua inglese” for several years). I had simplified the text to suit the class’s level of English. An enjoyable morning was spent and I could see the children thoroughly interested in this timeless story. The contract for the school has now finished. It was an enjoyable and enlightening experience and a fitting conclusion to my school teaching in Italy. Coincidentally, yesterday a friend, whose excellent guidebook to Barga I’d added some suggestions to, stated that one of the guests at the property she lets to visitors turned out to be Wilde’s grandson, Merlin Holland! Not so enjoyable was getting to Lucca: first a scooter ride to Fornoli station (30 minutes) in icy rain and then a train journey down the Serchio valley to Lucca. Still rain, rain, rain. 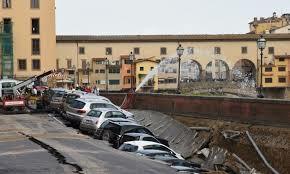 Fortunately the school is nearby (San Concordio). I would add that the weather hasn’t changed. A dramatic thunderstorm with hail assailed us last night and caused an electricity outage. I’m glad I’m not going anywhere fast this morning although the weather has quietened down somewhat. After the lessons I met Maestro Francesco Cipriano, the editor of Lucca Musica, the free monthly magazine which gives all the news about what’s happening in the music scene around Lucca, who presented me with his delightful “Le Novelle di Tommaso” – a musical based on stories he told to his grandson. 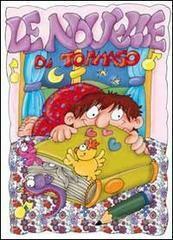 The first one is titled “La volpe e il pulcino” (the fox and the chick) and the last one is about dinosaurs. The beautifully produced book comes complete with music score and CD of a recording of his work. I still keep up my relationship with Francesco since I do the English versions of the programme of music events in Lucca for his LuccaMusica. Unfortunately, however, the magazine is now only available on line at http://www.luccamusica.it/language/en/ since funds were not forthcoming to keep the paper versions going. I do hope, however, that the paper version will return as it is a lot more accessible than just reading about events on a computer or smartphone screen. This is going to be a big week for Lucca (and Francesco) – lots of events and concerts (including Bocelli and a performance of Beethoven’s 9th) are part of a bid for Lucca to become Italy’s second UNESCO city of music. It certainly deserves to become one. Unfortunately Lucca has not yet become Italy’s second UNESCO city of music although it continues to deserve to be. I doubt few cities the size of Lucca have such a cornucopia of music events which range from every genre from world-music through jazz and rock to classical. So there we have it. Will I still be blogging in a year’s time? I’ll find out when March 7th 2018 arrives! Today I’ll go down to my orto again to see about preparing it for spring planting. Here are some views of my last visit before several dismal days of rain descended upon it. Our own are us two, our cats and ducks (and two goldfish to be on the complete side) and that’s the company we spent our Christmas with. First we opened our presents (which are strictly either utilitarian or chocolaty). Then Sandra set busy preparing Christmas lunch. This was followed by quails and a variety of vegetables including fennel and mushrooms. Delicious! 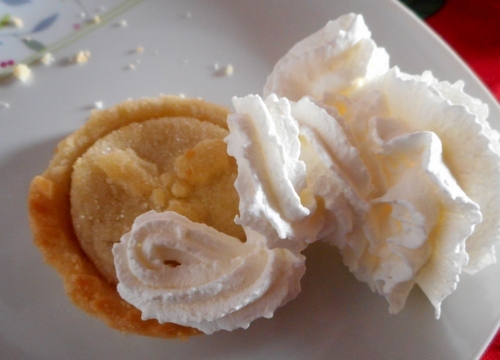 We finished off with mince pie and cream. After a little festive rest after lunch we went for our traditional Christmas walk with two of our cats Carlotta and Cheeky. (Napoleon is over seventy cat years old so we made an allowance for him). The skies may be dull but the autumn colours are ever more resplendent in our valley and do help to brighten up the day. Here are just a few of the hues we can see this afternoon (and don’t you think I’m an excellent circus cat? My next bid is to try some tight-rope walking). How are the colours in your part of the world’? Castagnate (chestnut feste) abound at this time in our part of the world. They are places where one can meet up with friends, enjoy products made from the chestnut (including, of course, roast chestnuts themselves!) and they are also places where old memories are remembered and traditions revived. Where would one be without marrons glacées, chestnut jam, necci (chestnut pancakes made with chestnut flour), mondine (roast chestnuts), chestnut cakes (delicious! ), and pan di legno (literally ‘wood bread’) chestnut bread? There are so many castagnate happening now and they are all as unique as the little villages where they take place. Last Sunday, for example, there were the following to choose from near us and this is just a selection! You’ll still be in time for the castagnate at Bolognana and Trassilico on October 16th. 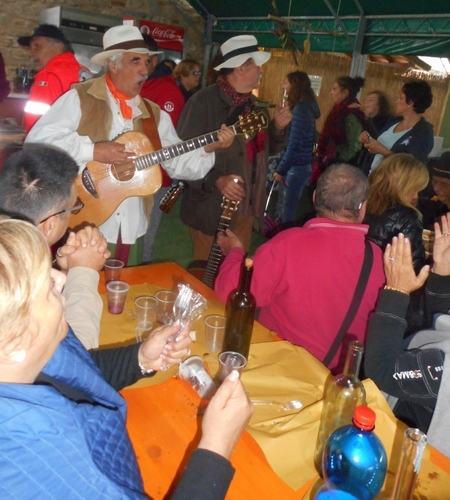 the ones at Mont’Alfonso Castelnuovo di Garfagnana, Careggine and Pieve Fosciana on October 23rd, the Pontecosi castagnata on October 30 and the Lupinaia one on 13th November. There will be others in our area of course. You’ll just have to look out for them! We’d never been to the castagnata at Cascio, so plumped for that one this year. The weather however, looked ominous with very stormy, dark clouds. It turned out, indeed, to be a somewhat wet castagnata but visitors were out in droves, the umbrellas added a colourful touch and, luckily, the locals didn’t postpone the event. For when it rains in Italy it’s truly a serious thing and, unlike the UK where precipitations seems more the norm, rain in Italy tends to completely reschedule open-air events. We queued up to get our tickets and I obtained an excellent platter of local products including biroldo – a sort of blood-sausage -, pecorino cheese, bread, crisciolette (see my post at https://longoio2.wordpress.com/2016/08/01/whats-a-criscioletta/ to find out what those scrumptious items, unique to Cascio, are), wine and water, and even managed to find a dry spot under the ruins of the fortress. The views from this part of town are stratospheric. Meanwhile, the serving department was busy at work. This year the chestnut roasters were saying how lucky they were to have a warm toasting fire before them. It was getting a bit nippy with all that rain! Last year, evidently, they were complaining how unnaturally hot it was at this time of year and what a sweaty job roasting the caldarroste. The village’s gatehouse had two fine local photographers displaying their art. The ciambelle (doughnut) makers were busy at work. Two wandering minstrels gave us a medley of favourite songs including that perennnial ‘volare’ by the great Domenico Modugno and now almost sixty years old! The upper part of town had the necci makers hard at work with their ferri (waffle irons) and there was also a desert course included. A sign tempted to a metato (chestnut drying hut) deep in the surrounding woods where further goodies awaited us including a delicious liqueur made out of chestnuts. I was told that I could find places that sold it in and around Barga. All-in-all it was an exhilarating day with the rain diminishing in the afternoon. Congratulations to all the Casciani for their great efforts to make this Castagnata another success in their annual calendar of events. On my way back from Vagli’s Tibetan bridge (see previous post) I came across one of Italy’s own noblest green-robed senators of mighty woods (to adapt a phrase from Keats’ ‘Hyperion’). This senator was a tiny seedling when the New World was just discovered, and has given hope and nourishment to generations of families in the areas of Roggio, Puglianella and Roccalberti. It still belongs to the descendants of those families. For me it is one of the loveliest living beings upon this earth and something to truly kneel before in awe and adoration. No wonder our ancestors worshipped trees (and some of us still do!) There are many religions and cultures which give praise to these verdant giants thankfully, for without them we would not only be deprived of their fruit and wood but, most importantly, of their life-giving oxygen. The Bread of Life in our part of the world is not just the Divinity but the Castagno, the chestnut tree, which has supported so much of the population with the flour made from its fruit. This magnificent tree, a little outside Roggio, is half a thousand years old and is truly an immense power emanating a mystic strength which I felt throughout my whole self as I touched it. There are many other such colossal beings in your area and perhaps, if you live here, you may have your own favourite Castagno. Just feeling it and putting your arms round it will fill your whole existence with new life and energy because the tree is one of the highest manifestations of life itself. Here are some of pictures of that ‘Castagno monumentale’ di Roggio taken the other day.It’s 86 feet high and its circumference is 33 feet. 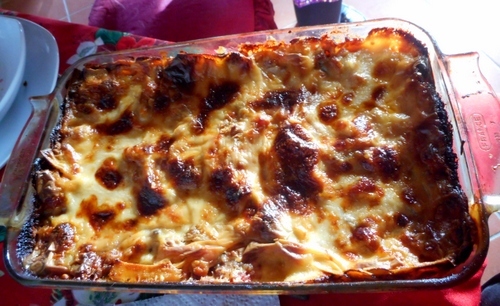 Which reminds me – have you already been to your Castagnata if you live in this part of the world? Yesterday I was at the delightful one at Cascio. If you weren’t there you’ll have to read all about it tomorrow…. The situation in Florence is a far cry from the peaceful estuary of the river Arno where retoni or giant nets lie suspended waiting to be lowered and catch their fill of fish, mainly whitebait but often larger varieties. 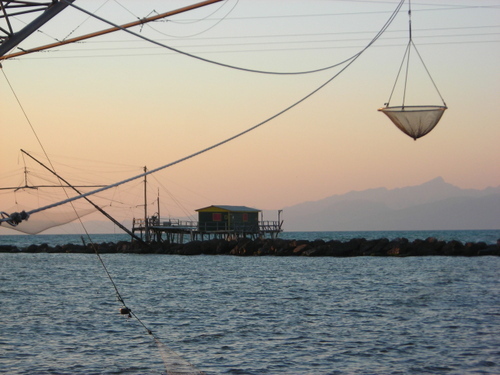 In August 2007 when Marina di Pisa had not yet received its new port the situation was even more peaceful. I remember enjoying an afternoon of conviviality and good eating with friends there in 2007. It was fun lowering the nets and then seeing what they would catch. It was mostly whitebait which we then barbecued and deliciously ate. The sunset was brilliant too! Each valley branching off from the Serchio River, running through the Mediavalle and Garfagnana, has its own character and none more so than the Turrite Cava valley. The first part of this valley skirts an artificial lake, goes past a recommendable restaurant, il Laghetto, before plunging further into the depths of the Alpi Apuane and reaching its main centre, Fabbriche di Vallico, well worth visiting for its noble houses and stunning location. ‘Fabbriche’ derives from the word ’Fabbro’ meaning ‘ironsmith’ and the area used to be well-known for its forges, many of which were still in operation until the last quarter of the twentieth century. The art of forging was first brought to this area in mediaeval times by ironworkers from Bergamo in North Italy. They took advantage of the plentiful local supplies of chestnut wood and water to build up a considerable industrial presence. The forges made a variety of objects from gates and railings, to agricultural implements, to kitchen items such as griddles used to this day for cooking necci (chestnut pancakes). I stopped to take a look at the largest of these forges at Gragliana a little outside Fabbriche di Vallico. This is the last one to close and has the largest forge hammer in Europe. After the heavy rains we’ve been having recently the torrent feeding the iron forge was in full spate and the waterfalls produced were quite magnificent. I tried to locate the forge hammer but was unable to do so. Perhaps it was in one of the buildings, now disused but locked. There was a narrow bridge over the torrent. Everything looked quite overgrown. I felt, however, that a little tidying up would make this ferriera a truly interesting industrial archaeological site for visitors. 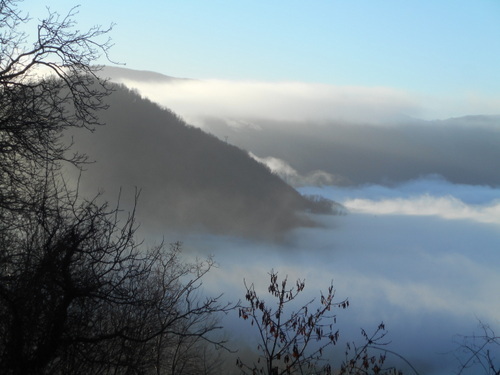 After the forge the valley rises up into expansive upland pastures and reaches the village of Palagnana. From here I hoped to reach the top of Monte Croce to enjoy the flowering of yet more Narcissi Poeticus just as I had enjoyed them last week on the top of the Prato Fiorito. Unfortunately, the clouds came to envelop an initially blue sky and it started to rain. I managed to get back to Bagni di Lucca Ponte via Pescaglia, passing other attractive villages, just as the rain turned to ferocious hail. I sheltered and recovered in the Monaco bar there with a welcomed glass of Campari.